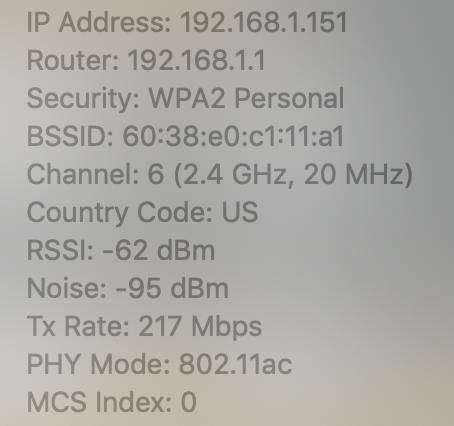 I have a 2015 Macbook Pro 15", and when I connect the mini DisplayPort to my external monitor, the WiFi speed drops significantly (from > 100 Mbps to < 10 Mbps). I noticed that the WiFi noise level jumps from -95 dBm to -75 dBm after I plug in the DisplayPort cable. I tried several different WiFi channels (1, 6, 11) and there is no significant difference between them, so it's some sort of broadband noise. Since the SNR is so low, the MCS index is set at 0. The other annoying thing is, once MCS is set to 0, even after I unplug the DisplayPort cable and the noise level drops back to -95 dBm, the MCS is still stuck at 0 and my WiFi speed will not recover. Even turning WiFi off and on again won't help. But this is a secondary issue. My main problem is why display port will introduce such strong noise which kills my WiFi speed in the first place. The cable I use is a Monoprice mini-DisplayPort to DisplayPort cable. I got a new mini-DP to DP cable and this time the noise level dropped to the normal level of -95 dBm. However, the MCS is still at 0?? The WiFi speed increased to 20+ Mbps but still not where it should be. Turn off the Wi-Fi Direct function on your LG 4K monitor if it does have one (check the LG documentation) and you will be able to recover a Wi-Fi network working. If your cable isn't a shielded one (this should be written explicitly on its packaging) or doesn't have a ferrite core , just replace it. Sooner than later you will have interferences on your image displayed and on all use of radio frequency within a few meters. Another way to workaround this huge noise level could be to switch your MacBook Pro on a 5 GHz network = channel above or equal 40. This configuration has to be done on your equipment building your Wi-Fi network. This is your Belkin wireless router. But this won't fix the origin of the problem. Not the answer you're looking for? Browse other questions tagged macbook wifi thunderbolt mojave displayport . 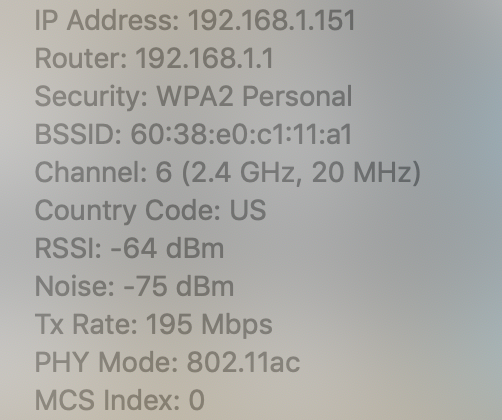 OS X status bar wifi icon - meaning of bars?